I don’t know. Maybe rather than moving to North Carolina, I should scoop up this tiny gem on the Hudson River? Recently REDUCED to $20million. Bargain. 289 acres. It seems so me, a simple country gal in a simple country home. Right? Atalanta, an irreplaceable Hudson River Mansion on the grand scale of its neighbors north and south, was erected in 1851 of brick and stone to the plans of noted British architect Frank Wills. It evinces fulsome and artful details derived from his vast renown in ecclesiastical design. Its Italianate articulation had Romanesque flourishes of great power. Its purpose was to provide both a splendid river view and elegant living for the expected large family of Franklin Hughes Delano (for whom his great nephew FDR was named) and his bride Laura Eugenia Astor, daughter to William Backhouse Astor, then, upon the decease of his father J.J. Astor in 1848, the richest man in America. He gifted the house parcel (95 acres) that same year from his own 724 acre “Rokeby” to the north as a wedding present. The estate was augmented in 1873 when Laura acquired her brother’s 142 acres to the north and again in 1875 when Franklin acquired the 254 acre Palatine Feller-Benner Farm to the south. Known during its 133 years in Astor/Delano ownership as “Steen Valetje”(little stone valley) for the so-named creek that runs through the property just south of the main house, its sumptuous interior spaces (16,600+sf) include commodious public rooms with 18′ ceilings that exhibit frescoes, exquisite fretwork and marble fireplaces with delicately carved surrounds (there are 16). These public rooms have oak and mahogany parquet floors and often French doors that open to river terraces and porticoes. The house affords ten generously proportioned bedrooms (several are ensuite), ten full and three half baths, a formal wainscoted and architraved entrance hall and grand staircase with its domed and frescoed skylight and adjoining upstairs hall, also with its companion domed and frescoed skylight. British and New York architect Thomas Stent (the NY Public Library and Parliament Buildings, Ottawa, Canada) designed the major replacement of the southern extension, with grand living room/ballroom (42’x26′) and galleries, of Steen Valetje and other interior embellishments for Franklin Hughes Delano in 1881. The present day 290± acre Atalanta is surrounded on its northern and eastern sides by lands owned by or under easement with Scenic Hudson. The western boundary lies a ways into the eastern waters of the Hudson River. The main entrance from River Road is via a stone pillared gate and arch windowed and hip roofed gatehouse designed by Walter Schickles & Company c1878. Building on the plans and landscape work of German-trained arborist to royalty Hans Jacob Ehlers (1804-1858) and his son Louis, known for their picturesque designs at both Rokeby and Montgomery Place directly to the north and the Vanderbilt Estate and Marienruh to the south, Atalanta now enjoys ancient lanes and lawns with stately oaks and other now mature specimen trees. A greenhouse, seven barns including a handsome 1875 brick carriage barn designed by Arthur B. Jennings, a stunning pool and Doric temple poolhouse, nearby tennis court, walking and bridle trails, woods and fields, four mostly antique and discreetly elegant guesthouses, lush formal and informal gardens and three ponds adumbrate further the picturesque nomenclature that now includes a 160’x80′ heated indoor riding arena, outdoor dressage ring, proud new horse barn and paddocks. It is rare indeed to find a superlative estate of this scale, pedigree and careful stewardship set amongst such a string of pearls of patrician homes bearing names of those families that brought America to star on the world stage. No denying, the grounds and views are extraordinary. The interior, while grand, is taste specific, also very heavy and dark, although I am sure purists would say one could never replicate that kind of woodwork or brickwork ever again. I suspect they are right. I can’t quite tell what the wall on the left is made of – tile? Or is that a work of art? But look at the ceiling. Not at all my taste but it is superb detail and you can see these owners have maintained the home pristinely. The folding interior shutters alone today would bankrupt me were I to buy them. The owner is at minimum a proud patriot… ignore the curtains and look at the floor. I mean, there’s probably not a craftsman left on the planet who can do that intricate work. In the days when men had their own room….the patina of the wood looks a little dull to me but perhaps that’s the kind of wood it is? The barns and stables – any horse would be happy here…. This Houlihan Lawrence YT video gives a better overall view of the home and grounds. Note: Within the Klemm listing is another video that I can’t post here, on Vimeo, a media type not supported by WordPress, but do watch it too. Klemm Dining Room photo on left. 6sqft photo on right. They don’t look like the same room. Same with many of the other photos. I can’t imagine 6sqft took their own photos so perhaps they altered them all, brightened them? The estate is currently owned by investment adviser Martin Sosnoff and his wife Toni, contemporary art collectors. They listed the estate because they now spend most of their time in Florida, but noted that when they’re in residence it requires a staff of 14 to maintain the property. Here’s my two cents: The house is not MY cup of tea at all. I couldn’t afford to mow the lawn and there’s no mention of the property taxes but I guess if you have to ask, you can’t afford the house. $500k taxes? But, I say kudos to Mr. and Mrs. Sosnoff for having their dream home, preserving a unique and historic home. Sosnoff built a financial empire so more power to him to create a home that he feels can show his love of history and the arts. Down to $20 million. Such a deal. 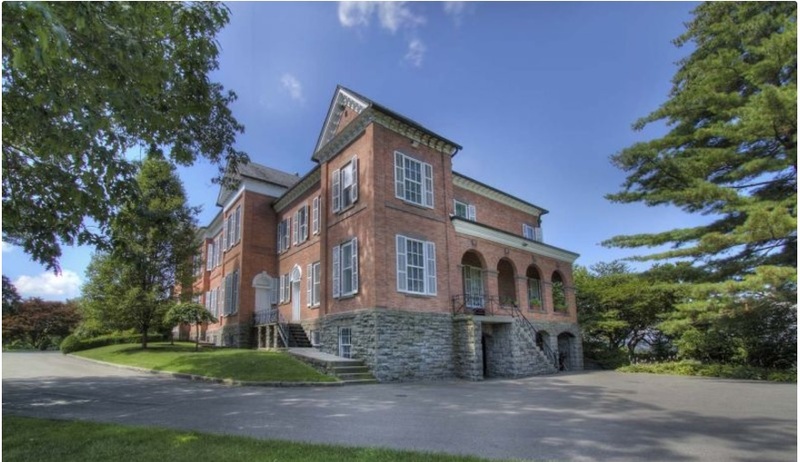 When you look at all it has though, all the land, all the outbuildings, the rare unobstructed view of The Hudson, the way the house has been cared for, $20m almost seems low. Indeed it does. Great post! Thanks and especially thanks for joining our fun little family. Your blog and your story are incredibly fascinating and who doesn’t LOVE the title Book ‘Em Jan O. Well done Jan. Well done. Here’s her About Me page. You lost me at Red Hook/Rhinebeck. The location won’t appeal to many. I can see Trump might have bought (pre-POTUS gig) and used as a venue for a golf course or club like Mar-a-Lago. I don’t care at all for the style of home but I agree It is maintained to perfection. Agree the location is a minus but someone looking for total privacy and a statement home, I can see how this would appeal. More modern decor would help. Less wallpaper and more painted walls. Jane: This is SO a Trump additional home had he not been president. I’ll take pleasure that he’s president however and let someone else snap it up. The problem with this house and many others this large and opulent, is even the wealthiest among the wealthy don’t want this much land or house to take care of. It’s one thing to have a 13k square foot house but then have barns and gate houses and cottages as well as 290 acres, it eliminates 99.9% of the buying pool. I hope it is preserved if not bought. The owners could create an art venue, like Storm King. Rent out the stables and arena to neighboring horse lovers. Lots of good uses for it. There are not enough pictures of the exterior to really judge whether I want to put up with that funky interior and the outbuildings aren’t inspiring much confidence. Still want Ranch San Carlos in Montecito. I think it’s ON PURPOSE that there’s aren’t many of the exterior. It’s awkwardly shaped and the brick isn’t a very pretty color. The white shutters don’t help. This angle in particular makes the house look top heavy or strangely angled. Tru dat. Wappingers Falls makes Rhinebeck look like Santa Barbara. ← There are Three Types of People in this World: The Doers, The Complainers, and The Abject Losers.